· How do I carry out a risk assessment? Health and safety in the horse industry can sometimes be likened to a “horse with a funny look in its eye” - there are those that are frightened to approach it and those who do sometimes get it terribly wrong, with disastrous results. The first three weeks of 2007 saw comments in equestrian magazines that health and safety is taking too much time, stopping worthwhile activities and is responsible for businesses closing down. These views aren't new and are frequently echoed across the industry. Sadly there are too many “bonkers conkers” examples in all walks of life. A council decided to remove goalposts from a children's football pitch, fearing that ramblers might bump into them at night. Another council employed a health and safety consultant to draw up rules on how to make a cup of tea safely1. Unfortunately, we hear similar equestrian related stories from the horse industry. In response to the consultation on the industry strategy Riding Safely commented4 “There are no specific proposals within the draft strategy that address the management of the risks associated with health, safety and environmental issues that may seriously impact on public and employee health & safety and affect the public perception, viability and business performance of the horse industry”, adding that action needs to be taken. The “horse with a funny look in its eye” is still there and the risk is that it will continue to be there until those who represent the bodies at the top of the industry tackle the problem of health & safety once and for all. It's time for the industry to act to protect people, horses, activities and keep businesses in business. Following hot on the the heels of this month's Comment - "What's the risk?" Guidance on How do I carry out a risk assessment? The influential joint BHIC/DEFRA horse industry strategy has received positive feedback throughout the world, including the USA and Japan. Most recently it has been debated and discussed in Japan, demonstrating that the groundbreaking strategy work which we are undertaking is being taken up by other countries. 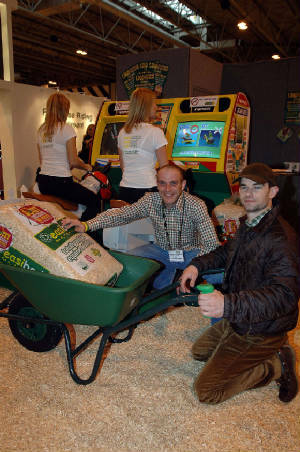 BETA International, the world’s foremost equestrian and country trade exhibition was held at the National Exhibition Centre, Birmingham, UK from 18-20 February, 2007. Retail buyers from the equestrian, country clothing, outdoor and pet markets visited BETA International to see products exhibited by around 400 companies from more than 20 different countries. Attendance over the three days was 5,378. But what did Riding Safely find of interest at BETA International 2007? At BETA International, Riding Safely is always on the lookout for quality products that can minimise the risk of accidents and injuries. So what met the criteria this year to form the choice of Riding Safely? EZ Tippa Wheelbarrow from the Real Barrow Company. Riding Safely adds - There are far too many people who work in the horse industry who suffer from aches and pains in their backs as a result of lifting and handling. Manual handling is an issue for the industry and anything that can minimise the risk must be welcome. Riding Safely adds - keeping loose studs safe and secure is essential. A lost stud can be a dangerous stud, particularly to horses. Riding Safely adds - Probably an overlooked product when it comes to horse fencing. 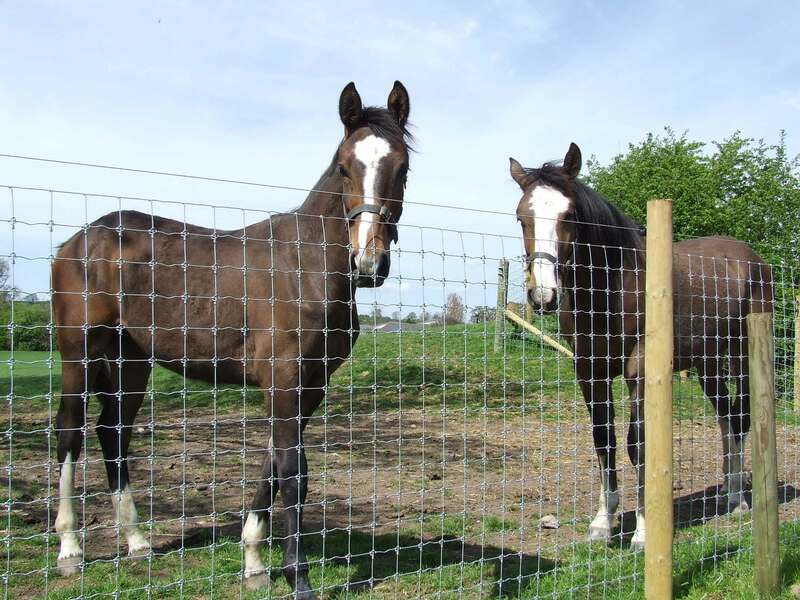 A product that combines strength and a mesh size to minimise the risk of entrapment has the potential to be a cost effective fencing solution for everyone who needs to keep horses safe and secure on their premises. Riding Safely adds - if you're comfortable with using a computer then these products may be for you. There's never ever going to be a substitute for practising with your horse, but by being able to learn and visualise the test before putting a foot in the stirrup, these have the potential to reduce the mental and physical stress for both you and your horse. Now in their fourth year and widely acknowledged as the equestrian industry’s ‘Oscars’, the awards were presented during the BETA Gala Dinner at the Metropole Hotel in Birmingham, on 18th February. 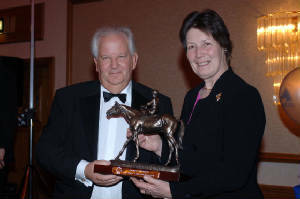 Riding Safely would like to congratulate and make special mention of this year's winner of the BETA Lifetime Achievement Award, which is presented by BETA to mark special and significant contribution to the equestrian industry over a long period of time. This year it was awarded to Barry Fehler of South Essex Insurance Brokers (SEIB). Barry was 17 when he founded Specialising in Equine Insurance. As well as being the market leader in insurance for rural taxis, SEIB is now in the top 75 of all brokers in the UK. A lifelong horseman, Barry developed equine insurance as we know it today by introducing such innovations as cover for loss of use, loss by straying and veterinary fees. His ideas for a vet emergency helpline and horsebox insurance likewise grew from Barry’s equine-related experiences. SEIB has provided sustained support to wide range of equestrian events. Conceived a decade ago, Search For A Star has encouraged amateur riders to bring their horses to the show ring. Many ex-racehorses have found new jobs via the Racehorse to Riding Horse Show Championships which culminated in a HOYS final last year. Thoroughbreds across the disciplines have also been recognised thanks to the Racehorses to Riding Horses Points Championship. SEIB also supports BHS Hunter Trials, Trec, BEF Young Horse Evaluations, Trailblazers and the Riding Clubs’ Quadrille, Dressage to Music and Horse Trials. BETA’s Retailer of the Year Award is sponsored by SEIB, underlining the diverse nature of the company’s involvement with the equestrian industry. Married with three children, Barry owns more than 40 animals. Many have found sanctuary with the Fehler family, including ex-racehorses, re-homed Spanish dogs and cats and a pony called Tiny Tim who was found abandoned 20 years ago. A prolific winner with his show horses Assurance, Princes Street and Elite, Barry has also bred dressage and event horses. As well as owning SEIB, he is a director of the Institute of Insurance Brokers and of Broker Direct Plc. He also owns Escape Travel Ltd.
“Barry has proved that it’s possible to be successful by combining entrepreneurial skills with a genuine concern for the welfare of horses and their owners,” said Claire Williams, executive director of BETA. BETA International 2008 takes place at the NEC, Birmingham on 17-19 February 2008. The Highways Agency has completed construction of the new Leafy Lane foot and bridelway bridge over the M4 between Junctions 16 and 17, near Dauntsey in Wiltshire. The new bridge uses rubber tiles made from recycled tyres to make the surface less slippery for horses. In addition, it provides higher headroom clearance over the hard shoulders than the previous bridge. Other benefits of the bridge include raised sides and solid infill panels, so that horses cannot see traffic passing underneath. "The bridge has been replaced to meet current safety standards. The higher clearance means that the hard shoulders can now be used by high sided vehicles and also by the emergency services. "We have also been in consultation with the British Horse Society to make sure that the new bridge uses non-slip rubber tiles, which help horses to be more sure-footed when crossing. Our research has also shown that horses are calmer when there is screening in place, such as with the high sides on this bridge." 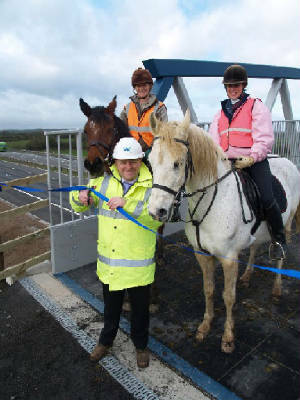 "This new bridge is a welcome improvement that is very much needed for horse riders. The solid infill panels and rubber tiles make it much safer and easier for riders to cross the M4 at this location than before." HORSE riders are being given a safe new route over the Brundholme and Spooney Green bridges on the A66 near Keswick. There are around 149 accidents involving horses on our roads every year, resulting on average in two deaths and 130 injuries to riders. THINK! has teamed up with the British Horse Society to produce two TV and radio adverts that warn drivers how to avoid accidents when confronted with horses on the road. Fees for criminal records checks have been frozen at last year's levels as the Criminal Records Bureau (CRB), achieves self-funding status for the first time. - access to improved data sources, including the British Transport Police, increasing the amount of information given to customers in a CRB check. "It has always been the aim of the CRB to become self-funding and I am delighted that it has been able to do this at the same time as handling increased demand and achieving record levels of customer satisfaction. The CRB plays a vital role helping to protect the most vulnerable in our society giving employers the extra tools they need to make informed recruitment decisions. "This creates a great foundation for future developments in the CRB. The agency will provide the administrative backbone to the Vetting and Barring Scheme, offering continuously updated vetting, a key recommendation of the Bichard Inquiry. "The speed and accuracy of CRB checks will also be improved through implementation of the National Identity Scheme and the agency is already working towards a joint venture with the Identity and Passport service." "The CRB is continuing to meet milestones laid out in the five year strategy outlined in 2006. Self funding status is a key landmark for the organisation and we will continue to build on the customer service improvements which help us achieve high customer satisfaction year on year. "The CRB will continue to develop the service it offers to its customers helping to improve protection for children and vulnerable adults. I am also pleased to confirm that volunteers will continue to get free disclosures." In 2006, the CRB issued its 10 millionth disclosure and is currently issuing over 250,000 disclosures every month. Demand is continually increasing: In 2002/3 1.5 million disclosures were issued whilst in 2005/6 there were 2.9 million. 1. The CRB provides access to criminal record information through its Disclosure service. It enables organisations in the public, private and voluntary sectors to make safer recruitment decisions by identifying candidates who may be unsuitable for certain work, especially that involving children or vulnerable adults. The CRB was established under Part V of the Police Act 1997 and commenced operation in 2002. The British Horse Society and the Animal Health Trust has launched a campaign to raise £250,000 to eradicate Strangles – a horrible disease attacking and killing horses. HRH The Princess Royal spoke movingly of her personal experience of the equine plague Strangles - an outbreak at her stables at her Gatcombe home. The Princess Royal said: “I am very pleased The Animal Health Trust and The British Horse Society are working together on this campaign. It could make a real difference to the welfare of horses. HRH The Princess Royal helped the two charities launch the campaign at the Royal Society of Medicine, London. Further regional launches follow in Edinburgh, Cardiff, Belfast, Birmingham, Manchester, Leeds and Bristol. BHS Chief Executive Graham Cory said: "We have a golden opportunity to stamp out this terrible disease. If the money needed for research can be raised, we are confident we can tackle this problem effectively and stem the spread of Strangles." He said: “The British Horse Society would lead by example in doing anything it could to ensure that the money needed for Strangles research was made. AHT Chief Executive Peter Webbon said: "Strangles must be beaten. We believe a solution can be found through our research programme. We urge everyone to help us and the BHS to end the suffering of horses and ponies caused by Strangles." Animal Welfare Minister Ben Bradshaw said: "The health and wellbeing of the equine population in the UK is vital and we welcome any opportunity taken by the industry to tackle important equine diseases such as Strangles. "We applaud this joint approach by The British Horse Society and the Animal Health Trust. We hope their fundraising initiatives are successful and the campaign is well received and supported by the whole horse industry." Strangles – triggered by the bacterium Streptococcus equi – is one of the world's most common respiratory diseases, hitting horses of all types and ages. It spreads like wildfire in stables, striking down horses at a devastating rate. Strangles kills up to 10 percent of the horses it attacks. Many others survive but become carriers of the disease without any exterior symptoms and go on to infect other horses. Strangles is an economic disaster for affected yards which often have to shut down for months. Getting rid of Strangles depends on research to improve methods of prevention and diagnosis. Eventing legend Lucinda Green said: "The Animal Health Trust and The British Horse Society are tackling Strangles - the equestrian world must do its best to support them. Strangles is a problem we can no longer afford to ignore. Every horse owner should be aware of the threat and be prepared to join in the fight against it." Top show jumper Nick Skelton said: "Strangles is a terrible disease that causes great distress to horses. I fully support The British Horse Society and The Animal Health Trust in their efforts to eradicate the disease." You can help by making a donation online by credit card or direct debit through the strangles campaign website http://www.strangles.org/, by phoning 08700 502380, or posting a cheque to; Strangles Appeal, Animal Health Trust, FREEPOST CB360, Lanwades Park, Kentford, Newmarket, Suffolk, CB8 7BR. Stables under threat - A Stables in Garston (Hertfordshire, UK) is struggling to stay afloat after a devastating virus (strangles) ruined its reputation, despite being given the all-clear months ago. The Horse Trust, based at Speen, has committed a further £1 million to equine research and clinical scholarships, creating five clinical scholarships and five scientific research grants following the recent meeting of its Scientific Committee. Paul Jepson, Chief Executive and Veterinary Director of the Trust said, "The Horse Trust's investment in equine research illustrates the charity's commitment to the health and welfare of all horses, to reduce pain and suffering and find cures and treatments to a variety of diseases." One horse has had to be put down and vets fear two more may face the same fate after a shooting attack in Surrey. Vets were forced to destroy a horse which suffered appalling facial injuries after being attacked in its isolated stable. The horse’s owner said: "I just keep asking myself what kind of sick weirdos would do this kind of thing to a trusting and defenceless animal who never hurt anybody. Concerns have been voiced about the health of Household Cavalry horses grazing in south Worcestershire. A horse rider told today how she desperately clung on to her mount when a pitbull-type dog launched a prolonged attack on the pair. Marina Davies, 64, said the dog sank his teeth into her Welsh Cob’s underbelly, causing the horse to gallop and buck for around 45 minutes in a bid to shake the animal off. Parents of a woman with ME have spoken of her devastation after the horse that was "her life" was killed in a fire, thought to have been started deliberately. The 20-year-old grey Arab mare Rose was in stables in Marsh Road, North Wootton, in the early hours of Wednesday when the blaze began. Despite the efforts of two Lynn fire crews, sadly they were unable to rescue her. SIX horses were rescued as flames swept through a livery yard on Teesside. Neighbours and a passer-by rescued the horses - one, a mare in foal - from their stalls at Bankfield Farm, Eston, as a straw barn was engulfed by the fire which was deliberately started. A FIRE ripped through a large barn in Suffolk containing gas cylinders and fertiliser, threatening to engulf nearby stables. INVESTIGATIONS are beginning today into the cause of two large barn fires in Suffolk. More than 50 fire-fighters were involved in tackling the blazes last night and early today. LPG cylinders should be kept in a safe, well-ventilated place, preferably in the open air, and away from occupied buildings, boundaries and sources of ignition and of heat. Cylinders should be kept upright and properly secured. The main use of ammonium nitrate is as a fertiliser. It is not in itself combustible but, as it is an oxidising agent, it can assist other materials to burn, even if air is excluded. Ammonium nitrate will not explode due to the friction and impact found in normal handling, but it can be detonated under heat and confinement or severe shock. Twenty panicking horses were rescued from a blazing stables by two brave young workers. Stable girls managed to chase the horses out as flames and smoke engulfed the building at Stainsby Grange Equestrian Centre, in Thornaby, Cleveland, UK. An electricity line which was brought down on a corrugated iron roof turning the whole roof live and starting three small fires in roof joists. This is an unusual case in unusual circumstances but demonstrates that if a non-conductive roof had been used this fire may not have started. When designing and putting up new buildings take into account all the risk factors before choosing your construction materials. Safe Hands Rescue Centre in Derbyshire was destroyed as a result of an arson attack on Saturday 27th January 2007. Fortunately none of the animals died in the fire. Arsonists who torched a stable destroying tons of hay were not to know that an eight-year-old pony, was not at home. A STRING of arsons in the fenland areas of the Cambridgeshire County have lost farmers hundred of thousands of pounds. Between Saturday (January 27) and Sunday (January 28), there were 13 stack fires in the March, Chatteris, Welney, Manea and Christchurch areas. No one likes an accident. Those featured in this section come from media sources and often lack the detail of the circumstances that may have contributed to the tragic outcomes. Even so, by being aware of the types of accidents that have happened in the past may help to prevent or lead to action to prevent similar accidents occurring in the future. The Bucks Free Press (23 December 2006) reports that an inquest heard that a teenage horse rider looked on in horror as her mother was thrown from her startled horse under the back wheels of a passing sewage truck. A VERY rare reaction to a kick from a pony killed an Egyptian boy at a riding school near Radlett last year, an inquest heard. The coroner recorded a verdict of accidental death. He said nobody at the centre could have done anything more to save the boy, a fact confirmed by exemplary health and safety reports. A young stablegirl drowned in just 30cm of water after being thrown off a horse on her first day in a new job. A young racehorse may have to be put down after injuring itself when it was scared by New Year's Eve fireworks. The four-year-old horse, which has not yet been raced so does not have an official name, is stabled at Joss Saville Racing, Gisburn Park, near Gisburn, and is said to be worth about £60,000. It was reported that Police were forced to close the busy Southwick Road near Wickham, Hampshire after an accident between a horse and a car resulting in the horse having to be put down at the scene. It is understood that the rider escaped without serious injury. A HORSE had to be put down and its rider taken to hospital after they were hit by a bus. Helen Retallick, 37, was riding home on Rocky, a 14-yearold former racehorse, when the accident happened, and credits her horse for saving her life. The international governing body of equestrian sports will investigate the accidental death of South Korean rider Kim Hyung-chil last year at the Doha Asian Games. The investigation will take place in London. Racehorse trainer Norman Babbage was nearly killed when two huge bales of hay crushed him. The 44-year-old was knocked over and trapped by two one tonne hay bales at his stables in Brockhampton, near Cheltenham. The hay fell 5ft from a stack, leaving Norman with a tear to his bladder and a leg broken in two places. Norman was taken to Cheltenham General Hospital, where his condition is comfortable. The Health and Safety Executive (HSE) investigated 202 bale handling and stacking accidents between 1986 and 1996. Of these accidents, 23 were fatal and some of the others caused injuries serious enough to stop those involved from working again. A MAN has been taken to hospital after being kicked in the chest by a horse at a Suffolk stable. An ambulance service spokesperson said the incident happened at Moulton Paddocks in Newmarket. A horse rider is recovering from surgery to her wrist after her horse was spooked by low-flying military aircraft. The Ministry of Defence is investigating the incident, which happened in late November. A Hall Green woman is recovering in hospital after breaking both of her legs when she was thrown from a horse. RIDERS are demanding a reduced speed limit on a popular short-cut after a horse had to be destroyed after a road accident. Emergency crews tried for three hours to save the stricken animal, which was knocked down on Cleadon Lane, East Boldon, South Tyneside. A runaway horse has been rescued after it plunged into a neighbour's swimming pool in Hampshire. The mother of a young Pembrokeshire horse rider who was trampled by her horse during a freak accident is in no doubt that her daughter’s body protector saved her from serious injury. Emma was leading her Shetland pony, Beans, during a riding lesson at her home when she tripped. The pony’s front legs became tangled in the leading rein and in his struggle to get free Emma was trampled. She escaped with minor facial injuries but her body protector bears the scar of what might have been. 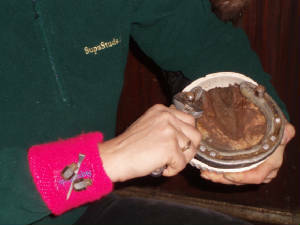 A hoof mark is clearly visible in the breastbone area, even though the horse was not shod, and the impact has broken the protective structure. Emma, a member of the South Pembrokeshire Pony Club, was taken to Morriston Hospital, Swansea but fortunately her facial injuries were superficial. She is expected to make a full recovery and the incident has not put her off riding. Her body protector will have to be replaced and her mother says she would like the damaged one to be used during Pony Club safety demonstrations as a reminder of how important they are. She said she would never allow Emma or her older sister, Anna, ride without a body protector. By law, all riders under 14 have to wear a riding hat (when riding on the road) but that isn’t the case with body protectors. Sue Scourfield, who runs the Pembrokeshire Riding Centre at Hundleton, said she would like to see the wearing of them made compulsory. No riders at her stables are allowed to ride without a body protector. “If someone has been clever enough to design equipment to keep us safe it is a foolhardy person who doesn’t use it,’’ she said. “I really believe that body protectors are a major protection, especially for children. Riders will still fall off and break arms, legs and noses but if the main core of the body is protected they stand a better chance of being safe from serious injury.’’ Sue says many riders were put off from wearing body protectors because they don’t like the look of them but there could be a high price for pay for the sake of vanity. This report is reproduced by courtesy of the Pembrokeshire Farmer (May 2006) and the author, Debbie James. The BHS is working to improve horse and rider safety on the roads. Neue Schule bits is recalling two bits from its range due to safety concerns. The company is offering refunds for the Comfy Contact eggbut cheek and baucher cheek released between 1 September 2004 and 31 December 2005. "We're not entirely sure there is a problem," said a spokesperson for the company, "but we sought advice from the appropriate bodies and are following their instructions." The recall follows two independent reports of the Comfy Contact bits breaking in the middle. "It is a safety issue," the Neue Schule spokesperson confirmed. Customers who purchased either of the Comfy Contact bits during the specified dates are advised to stop using them immediately. Neue Schule is offering refunds or exchanges. The Neue Schule bit company markets itself as providing "bits designed by thinking riders for horse's comfort and performance." A redesigned bit will be available to buy in approximately eight weeks time. "We were redesigning the bits anyway," said the spokesperson. "At the moment the barrel section in all these type of bits ceases to roll up and down the tongue when the rider takes up a contact. We are working on a design where the barrel will continue to roll at all times." For more information on the recall or Neue Schule's new bit email: rec@neueschulebits.com or (tel: 07865 022056). Motorists have been warned of a potential safety risk linked to the use pressure washers - which it was claimed could lead to tyre failure. This potential risk may extend to horseboxes, trailers and 4X4’s. Whether you’re trying to find out the legalities of driving a lorry, towing a trailer or just want further information about loading visit The Organisation of Horsebox and Trailer Owners website which is packed with helpful information. A Rider has won a £4,000 out of court settlement following an accident which she claims killed her horse. A MAN who drove his car into a horse throwing its rider to the ground before driving off was fined £325. Special Feature – Will I be successfully sued? Jane Phillips is the solicitor who acted for Dr. and Mrs. Henley in the infamous Mirvahedy v Henley case. The findings of that case have had ongoing significant legal liability and insurance implications for every horse owner in England and Wales. In this special feature Jane exclusively provides Riding Safely with details of some of the cases she has been involved with over the last two years - brought in Negligence and under the Animals Act - winning 8 out of 9. New rules relating to the welfare of animals during transport come into force on Friday 5 January 2007. The new regulations are intended to improve the welfare of animals during transport and apply to anyone moving live vertebrate animals in connection with an economic activity. Journeys excluded from the scope of the new rules include journeys not taken in the course of business or trade or journeys undertaken under veterinary instruction. The regulations require those transporting animals in connection with an economic activity to be authorised. Two types of authorisation exist: one for short journeys (over 65km and up to eight hours) and one for long journeys (including eight hours and over). Those travelling over eight hours may require the vehicles used to be inspected and approved. 1. Council Regulation (EC) No 1/2005 comes into force today across all EU Member States. The Regulation is implemented in England by the Welfare of Animals (Transport) (England) Order 2006 (SI 2006/3260). Parallel legislation is being introduced in Scotland, Wales and Northern Ireland. The following letter appeared in Horse & Hound Magazine on 8 February 2007 and helps to redress some of the concerns raised when horseboxes are used on an “amateur” basis. Sir - I refer to the article "Does your £5 win make you illegal?" (23 November 2006), regarding the use of HGV horseboxes, where prize-money or payment for petrol may be involved. The Vehicles and Operators Service Agency (VOSA) appreciates that the story may have caused alarm to some of your readers and this was not our intention. When approached by H&H on this topic, we wanted to ensure that all the potential legal boundaries were made clear. The reality is that the lawful definition of "for hire or reward" is reasonably wide, and whether or not this is taking place and an operator's licence required is ultimately for a court of law to decide. Our approach is to err on the side of caution when advising members of the public. Our aim is to enforce the law in a proportionate way. Generally, where a horsebox is used on an "amateur" basis, we would not normally consider that the vehicle is being used for hire or reward. We would not consider it in the public interest to prosecute the user of a vehicle (for failing to have an operator's licence) in cases where nothing more than petrol money or modest prize money were involved. Motorists face tough new penalties for breaking the law by using a hand-held mobile phone while driving from February 27 2007, Transport Secretary Douglas Alexander announced today. From that date, the fixed penalty will for the first time include the award of three penalty points as well as doubling the fine to £60. "Research shows that talking on a mobile phone while driving affects your concentration and ability to react to dangerous situations. It's quite simple - it's impossible to do two things at once and do them well. That is why in December 2003 we introduced new laws preventing motorists from driving while using a hand-held mobile. "We have seen a groundswell of support for this move. But, worryingly, while 92% of people agree with the law, 21% of drivers admit to breaking it. That is why, from 27 February, the Road Safety Act will introduce a tougher fixed penalty of three points on your licence as well as a £60 fine." A campaign to raise awareness of the new fixed penalty begins today and will include radio, press and online activity raising awareness of both the change in penalties and the dangers of using a mobile phone whilst driving. This educational approach goes hand in hand with continued enforcement activity by the police. Home Office figures for 2004 show that nearly 74,000 fixed penalty notices were issued for illegal use of a mobile phone while driving. In Wales, 3,482 notices were issued in the period. 1. Section 26 of the Road Safety Act 2006 increases the fixed penalty for drivers using a hand held phone or similar device. This section is being commenced on 27 February, and the penalty will then rise from £30 to £60 and three penalty points. The same changes are being made to the penalties for not having proper control of a vehicle - a measure which can also be used where a driver has been distracted by using a hands-free mobile phones. 2. If the police or the driver chooses to take a case to court rather than use a fixed penalty notice, the maximum fine is £1,000 (£2,500 for drivers of vans, lorries, buses and coaches). With reports of damage to equestrian properties the Health and Safety Executive issued two warnings that will still remain relevant in the case of any future severe weather. The Health & Safety Executive (HSE) has issued an urgent warning to employers and staff working outside to help prevent unnecessary accidents during the severe weather today in North West. "During severe weather like today's, with very strong winds and rain, there is an increased risk of major and fatal accidents, especially for those working outside and at height. Employers and workers need to reassess the increased risks of what they are doing in light of the changed weather conditions. Worker safety is paramount and must come first. "As well as the increased risk of slipping or falling from height there is also the danger of unsecured items and materials being caught by the wind and moving - potentially putting members of the public at risk. We would urge all those in control of activities affected by the weather to make sure the necessary controls are in place and take a common sense approach to ensuring the safety of their staff and others." "A number of different industries could be affected and may need to take extra care. The construction industry with its extensive use of scaffolding and materials placed outside, together with forestry workers, or farmers doing outside maintenance work could all be affected. "Whilst all businesses should routinely carry out a risk assessment of the activities they undertake, to maintain health and safety standards these assessments need to be revised where the environment they are being carried out in changes." * How is the weather affecting working activities? * Is safety likely to be affected? If so, what extra steps do I need to take? * Have my workers commented on conditions? * At what point do I need to consider stopping work? You need to consider stopping if worker safety is in jeopardy. Gale force winds in Kent have brought down a number of trees and more windy weather is forecast, the HSE would like to remind landowners to ensure that only trained and competent people are used to deal with fallen trees on their land. Extra care must also be taken when working in severe weather as this will make the task of removing damaged or fallen trees more hazardous. "We don't want to have a fatal accident following the current stormy weather. Chainsaws are dangerous machines unless you are trained and competent to use them. Any person using them should be properly trained and if they are not, should seek help from an appropriately trained and competent professional." "Companies and businesses employing contractors to work on wind blown trees should assure themselves of the contractor's competence before engaging their services. Arboricultural trade associations can supply details of approved contractors and information to help in choosing a competent tree work contractor." * Anyone using a chainsaw should have received adequate training and be competent in using a chain saw for the type of work they are carrying out. * Before starting work, operators should check work sites thoroughly to identify potential hazards. * Chainsaws should not be used by anyone under the age of 16. * Chainsaws expose operators to high levels of noise and hand-arm vibration, which can be controlled by good management and practice. The results of a recent intensive inspection of farms in Craven show that safety has been boosted since the Health and Safety Executive (HSE) threw the spotlight on the use of quad bikes in the area. HSE inspectors visited a total of 119 farms in the Craven area during the period 11 December 2006 until 19 January 2007, with the focus particularly on workplace transport, and the provision of protective equipment and training. Of the 87 farms with quad bikes, four were served with Prohibition Notices, one to stop the use of a quad bike without a helmet (despite one being available) by the 18-year old son of the farmer, and three to stop the use of a bike until a helmet was available. A further two Improvement Notices were also served, which require training of the quad bike operators. Throughout the inspection there was evidence that HSE's campaign had significantly raised awareness of the issue of quad bike safety. Farmers reported that the visits had prompted them to buy safety helmets, and local dealers noted an increase in the servicing of bikes and the refitting of tyres. As a safety bonus, there was also evidence that the inspection had prompted farmers had looked carefully at other risks on their farms and many had, for example, replaced the old or unsuitable ladders which are another leading cause of injury. This targeted inspection was prompted by the tragic death of a farm worker in a quad bike accident in Craven which lead to a £13,000 fine plus substantial costs for his employers. The case, one of two fatalities in the area due to quad bikes, highlighted the importance of the wearing of the safety helmet that could have saved the man's life for relatively little cost. All the farmers visited by HSE said they were aware of the background to both quad bike accidents. "All too often people are killed or injured due to lack of appropriate headgear in the workplace and the HSE campaign has helped to highlight the dangers. As a farmer who regularly uses transport in the workplace, I believe that you can never be complacent about wearing protective headgear, as it could be the difference between life and death." "Between 1996 and 2006 23 people were killed nationally in accidents at work on quad bikes. Of these 17 involved head injuries where no head protection was worn. "If you don't wear a helmet, you greatly increase the risk of serious injury. Sensible health and safety is about managing risks, not eliminating them. It is vital to always wear a helmet, maintain the vehicle properly, and consider getting some proper training in how to handle the quad bike. It is encouraging to see that HSE's campaign seems to be driving these messages home in Craven." Veteran Horse Welfare (VHW) now has one of the top celebrities from the world of Walford as their Patron. Eastenders star, Pam St. Clement who plays Pat Evans is now in her 21st year of appearing in the show and has become a household name, and has been in the lead role on many a gripping episode. The charity was formed in 2004 by Julianne Aston, also founder of the Veteran Horse Society in 2001. Commenting from the VHW rehabilitation centre Julianne quoted; “I am absolutely honoured and overwhelmed that Pam has agreed to become patron, she is a real genuine horse lover and very committed to our cause. I am sure that her celebrity status will help raise the awareness and plight of veterans within Europe and the UK. With millions watching this very popular soap opera, each week, we hope that the charity will now have much more recognition. Washington, D.C. - Keeping abreast of national legislation and regulations that affect all members of the horse industry just got a little easier. The American Horse Council’s newly improved web site provides timely and educational information on any issues in Washington, D.C., that relate to horses. In the early morning hours of 31 Jan, a barn fire believed to be caused by an electrical malfunction claimed the lives of two Thoroughbreds boarded at Warren Lyster's 100-acre Tarleton Farm near Paris, Ky.
Florida racetrack and state officials say they're cautiously optimistic that the current outbreak is over, with no new cases of equine herpesvirus-1 (EHV-1) detected. A sixth Florida horse died last Friday. That horse was part of a group already under state-imposed quarantine. Wellington, FL – January 4, 2007 – Stadium Jumping, Inc. hosted a meeting in The Jockey Club at the Winter Equestrian Festival show grounds to discuss the Equine Herpes Virus (EHV-1) outbreak. Approximately 500 concerned horsemen attended and many pertinent questions were asked of the panel. The outbreak of Equine Herpes Virus Type-1 that prompted protective measures at race tracks and area equine businesses has been brought under control. It has been more than three weeks since a horse has tested positive for the virus, Charles Bronson, Florida's agriculture commissioner, said in a release. The final equine facility quarantine was lifted over the weekend. Equine herpesvirus 1 (EHV-1) is one of a large group of DNA viruses causing potentially serious disease in horses and other species. EHV-1 has two forms—one that causes abortion in mares and one that causes respiratory infection and neurological symptoms. The most recent outbreaks of concern have involved the EHV-1 respiratory/neurological form of the virus. Some cities require equestrians to use headgear, but California has no such laws. Gary Hornstein is coping with his daughter's death the only way he knows how -- by ensuring others don't suffer the same fate. The Acreage resident's daughter, Nicole, 12, died in June after falling from a horse and striking her head on the pavement, blocks from the family home in western Palm Beach County. Now, Hornstein is pushing for a youth helmet law when the Legislature convenes in March. PALM CITY — Two days after being kicked in the face by a horse in a "freak accident," an 11-year-old Martin County girl can't wait to get back in the saddle, her mother said Tuesday. The Northern Territory's outback community is rallying around a severely injured campdrafter. Quita Docking is recovering from a head injury she received four years ago, when she was crushed by her horse. In a miraculous recovery, she has left her wheelchair and learnt to walk, and ride again. Her mother now wants to encourage all riders to wear hard hats. Cheltenham Racecourse is to be the venue for the 2007 British Equestrian Trade Association (BETA) Conference & Autumn Exhibition, to be held on Sunday 14th and Monday 15th October. BETA has enhanced the fixture to build on the success of its highly acclaimed inaugural Conference in Harrogate last October. The two-day, trade specific BETA Conference & Autumn Exhibition will run all day Sunday when delegates can tour approximately 30 trade stands displaying equestrian products and related services. Sunday evening will be a social occasion before Monday’s Conference with a line-up of influential speakers, industry discussion and the AGM. “Last year’s BETA Conference was a great success and a complete sell-out, so expanding the idea into the 2007 BETA Conference & Autumn Exhibition has been the logical progression,” said Claire Williams, BETA’s executive director. Admission to the 2007 BETA Conference & Autumn Exhibition will be strictly trade only. Non-BETA members are welcome to attend with only the BETA AGM being restricted to members. Defra published a draft new Animal Welfare Delivery Strategy for public consultation on 28 November 2006. You can respond and please note that the deadline for responses has been extended to 20 March 2007. The Strategy sets out Government’s vision for the delivery of animal welfare in England. It is aimed at stakeholders in all sectors and sets a clear direction of travel for achieving good welfare in the future. It includes 5 specific Strategic Goals, focused on key areas, and it explains that improvements in welfare will require a move towards greater partnership working, with an appropriate division of responsibility between Government and its stakeholders and an increased focus on innovative, non-regulatory delivery mechanisms. It defines clear roles and responsibilities for those involved in the care of animals and it sets out principles for use in prioritising future work. If you own a body protector then BETA (the British Equestrian Trade Association) want to hear from you! BETA are still conducting a survey to obtain information regarding the use and effectiveness of body protectors which in turn will be used to assist their continued development and promotion. Each month Riding Safely features a website that contains health, safety or environmental information that may be useful. The British Horse Industry Confederation was launched on 3 March 1999 to enable the British Horse industry to speak to government with a single, united voice. The aim of the BHIC is to work in a spirit of positive cooperation with government and other authorities to best serve the interests of horses and riders. The BHIC comprises the British Horseracing Board (BHB), The British Equestrian Federation (BEF) and the Thoroughbred Breeders' Association (TBA). It also has direct representation from the British Horse Society (BHS) the British Equestrian Trade Association (BETA) and the British Equine Veterinary Association (BEVA). The initiative was spearheaded by Michael Clayton (then BHS Chairman) and Tristram Ricketts (BHB) together with Lord Donoughue, who had served as an Agriculture Minister, and who had seen at first hand the lack of profile and fragmentation of horse organizations within government policy making and lobbying circles. This umbrella body was formed and for the first time ever brought together both racing and sports horse and other equine organisations. The current Chairman is Graham Cory, who is currently Chief Executive of the BHS, with Gavin Pritchard Gordon (TBA) as Vice-Chairman. · and to help raise the profile of the horse industry amongst officials and opinion formers. icWales reports that the Equestrian Wales website launched at the Royal Welsh Show last July has already attracted 600,000 hits - 45% of them from the United States. Figures show January as a record month, almost doubling the number of hits, pages visited and files opened. Welsh Equine Council chairman Martin Williams described it as "a breakthrough" for the equestrian sector in Wales. Need to know if you're doing enough to comply with health, safety and environmental requirements? Then this section is for you. The information in this section will be repeated and updated each month. Published in May 2006, this document sets out current good practice for environmental health practitioners; licensing officers; vets and animal wardens and also provides a useful tool for both owners and managers of horse riding establishments and livery yards. Supported by the riding industry’s major stakeholders, the guidance aims to fill a gap in existing literature and also provides useful checklists necessary to minimise the risk associated with such premises. It recognises the need to strike a practical balance to reduce hazards without hindering the sustainability of the riding industry. Safety with Horses is a cost effective, award winning equine health and safety training programme, leading to an accredited Vocational Qualification. The Level 2 programme is suitable for all those involved in any equine related activity including full or part-time students, clients, trainees, school work placements as well as those employed working with horses. Delivered in partnership with the Health and Safety Executive, Workplace Health Connect is a government funded service providing confidential, practical and free advice to small businesses on workplace health and safety, management of sickness absence and return to work issues. Horse & Country TV promo-launched on Sky channel 219 on 1 March 2007 showcasing with “Zara - A team tribute”. The Channel is then scheduled to launch in June with the full launch at the Royal Show on 1 July 2007. 2007 is likely to be the warmest year on record globally, beating the current record set in 1998, say climate change experts at the Met Office. A cash-strapped horse sanctuary blighted by huge bills, arson attacks and thieves has shut its stable doors for the last time. A month after the Willow Tree Horse Sanctuary in Finchingfield was devastated by strong winds, Dunmow Broadcast reporter Michael Boyton returned to see how things are progressing. Sir - Hats off to the BBC Breakfast News presenter who put his hat on, along with body protector, for a lead rein lesson with Tim Stockdale at Olympia last week. Not only did it give Tim, following on from the success of Only Fools on Horses, an opportunity to promote the benefits of learning to ride at Riding Schools, it also provided a positive image of safety. A tiny foal rejected by its mother thinks he is a dog after being raised with two Labradors. Your e-mail address will only be used for the purpose of letting you know about Riding Safely updates. It will not be used for any other purposes whatsoever or passed onto third parties.